See how treating into the easier direction of motion creates miraculous results. You'll never stretch your kiddos again! The go to program for torticollis & cerebral palsy! JUMP START your skills by starting to learn TMR Tots & Teens TODAY! Don't wait to help your clients achieve better functional outcomes. Just register for a future course that you would like to attend either Live or Live Online - you can change the date up to 30 days before the course. Contact the instructor when you are ready for your 4 week access to the video series. It works like a library book that you sign out and can renew if you need more time in the future. With Just a Few Simple Instructions . . . Your Results will Explode! Amazing Results in 45 Minutes with a Most Complex Torticollis Case! Thanks to Dr. Kim Lephart, PT, DPT, MBA, PCS for sharing her exciting results the week after attending Tots 2 and learning the 3-D motions! The child has a Level 5 case of torticollis –the most complex and difficult restriction pattern to treat. She was unable to side bend to pivot in prone! What a difference in just 2 sessions. Plus the child not only maintained range, she improved between sessions! The power of TMR Tots & Teens! Awesome Result with Young Man With Severe CP! Immediately after TMR Tots & Teens expect to have your skills enhanced, and begin to make breakthroughs you would have never believed a child might achieve. 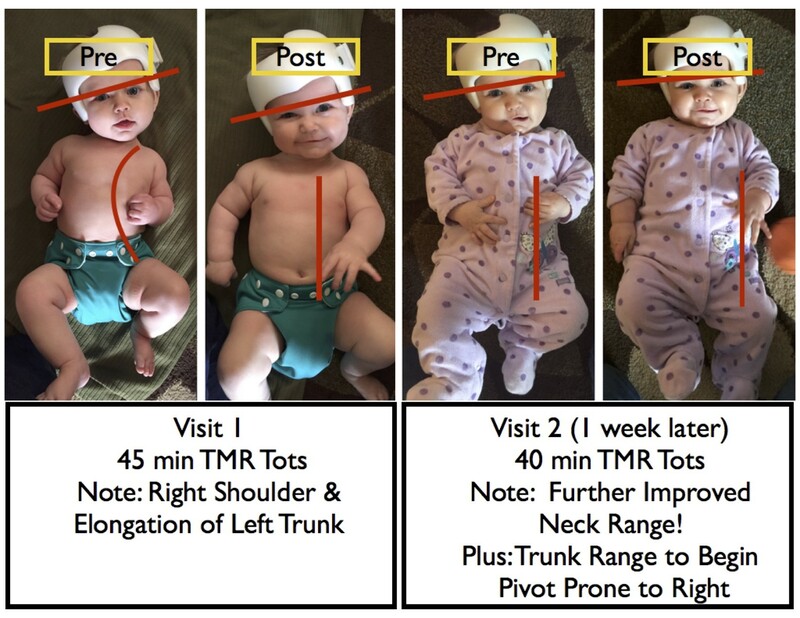 TMR Tots & Teens have gotten the most attention as a no tears way to treat torticollis and gait asymmetry. but was initially developed to treat syndromes and neurological issues such as hypotonia and CP. This young man was seen for just ONE treatment session by a recent attendee after taking TMR Tots level 1! Note his improved symmetrical posture and comfort. Imagine the possibilities for your children.
" This course is the heart of the PT body, pumping vital knowledge that is improving the lives of our kiddos. This course is a MUST for the future benefit of all children requiring any therapy " . "I really like the info & I am ready & excited to use it! I learned way more treatment techniques than any other cont. ed. course I've ever taken. " "Yes!!!! I am so thankful for TMR. I would add that for me, also with 42 years of pediatric practice, NDT certification, some training in myofascial release, etc., TMR has changed my practice and my life. It has given me a systematic approach to fixing myself (old polio, right sided LE primary weakness, now with significant ortho issues resulting from a lifetime of asymmetry, and increasing weakness due to ageing). The importance of making an attempt to equalize myself at the start of each day and throughout the day, from a mobility standpoint (even though it is impossible from a muscular standpoint) is why I am still as functional as I am and only recently have had to significantly decrease my practice. One of the most major impacts I feel it has on children, especially babies, is the concept of preparation of the body. I have always done "getting ready work" with my kids to try to modify their sensory systems, and musculoskeletal systems prior to asking them to do tasks as it makes sense that we want to make modifications on as near a normal readiness state as we can. It is here that TMR Tots & Teens shines through the most for me. The concept that we are programmed as human beings to progress, reflexively and instinctively, through a developmental sequence to upright mobility is paramount. Our kids get stopped or stuck somewhere along the way due to a variety of reasons, being cramped in utero, spending too much time on their backs and in containers, not being held, carried and moved enough to help develop their sensory/vestibular systems, neurological insult, prematurity and extensive hospitalization. Once they are delayed and they grow, and their body proportions change, that movement can be more difficult for them as the lever arms are different than when newborn. TMR Tots & Teens provides a systematic way to identify and release the restrictions that block their movement...that makes some movement seem impossible to them because they can't overcome it on their own to progress along the preprogrammed path to upright and may give up......For so very many of our littles, all they need is to have that restriction released and to be shown that the movement they need is possible and they take it over and own it.......magic...... "
"This is a must attend course. Every PT & OT needs this information so they can modify their treatment plans and techniques. You will wish you took this course years ago. Don't wait!" . "For TOTS-2 : I am so thankful to have some new ideas & understand better how to progress & challenge those with more subtle issues. Susan's great analogies/ visuals are easily explainable to families. " "Regarding TOTS-1 Homestudy Course - TMR provides additional tools for a therapist to use that creates easy and comfort for a child to improve their mobility. It allows for a more enjoyable treatment session and improved compliance with a HEP since everything is to the easy side !! No Tears, Just Smiles TMR is Great "
Precise identification of apex of curves matched with associated hard side directions. Utilizing motions to increase range Utilizing strengths in whole body to precisely shorten and build control on convex side. Identify fascial bias from acromion to opposite ASIS treated with motions and myofascial treatment into ease over pecs. Used lower body to get full range in UE. Independent alternating steps at 3rd visit. Crafted precise motor control/ release pattern with switch-hitting at a specific height to eliminate pain and improve game. Breathing stabilized able to get off oxygen. What is TMR Tots & Teens?